Enjoy a dynamic twist on traditional design with this eye-catching pendant. Treat yourself and create sparkle in your life or gift it to that someone special who enjoys feminine style. 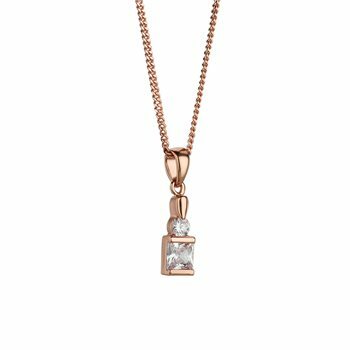 Rose gold plated square drop pendant with a protective anti tarnish layer, clear cubic zirconia stone settings, presented in a Newbridge Silverware gift box.